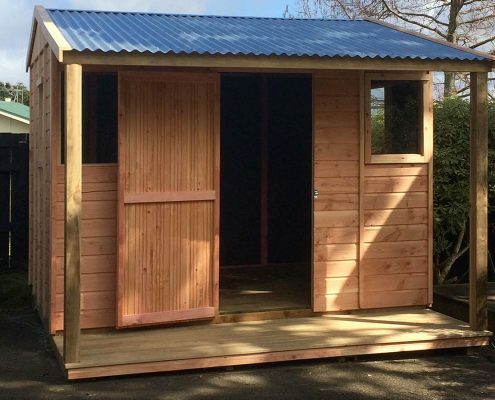 A number of different sized models are available to provide for many uses ranging from a small tool locker or garden shed to a large home workshop or studio. The buildings are delivered in kitset form with assembly instructions and all the necessary fixing components needed to fully complete the building. The kitset consists of pre-manufactured wall panels that screw together to form the walls of the building. A timber floor, verandah, fixed and opening glass windows, double hinged doors and acrylic roof panels are all available as optional extras. Upon completion, the exterior of the building needs to be treated with a good quality timber sealer to maintain its durability and appearance. Ideal for wood sheds, pool pumps or garden tools. No, buildings under 10 square metres do not need a building consent. 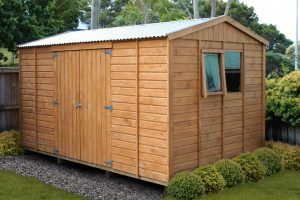 Note : It is the responsibility of the purchaser to ensure that the shed does not infringe local authority regulations. What is the Cladding made of? What size sections do they come in? What type of windows are they? Fixed pane windows or opening windows. You choose. Where do I get the glass from? 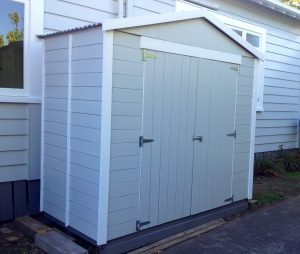 Can I line my shed? Can I put my shed on concrete? 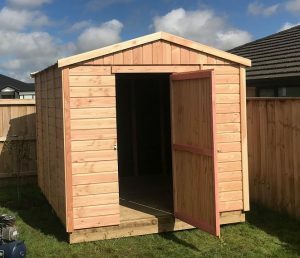 Why should I buy a wooden shed? It’s a natural product, and looks great! Can I put the door/s and window/s anywhere? Do I need to stain my shed? You can do it yourself or we can construct the floor and shed kitset for you. Will the kitset fit in my car? No, and you will need a standard size trailer if you are picking it up from one of our factories. We also offer delivery nationwide. How can I lock my shed? The external slide bolt we supply allows a lock to be used on it. Do I need to buy all the screws? No, all the hardware comes with the pack. Can I move the shed if I move houses? Yes. The shed is screwed together so that it can be disassembled and moved, or a hi-ab can relocate your shed. Do I need to do any maintenance on the shed? Apply a good quality exterior stain or furniture oil. Are they made in New Zealand? Yes. All the wood is sourced in New Zealand.